John is Supervisor of the Alpine Department at the Royal Botanic Garden Edinburgh and is Vice-Chairman of the Scottish Rock Garden Club. He has participated in many expeditions, including to China, Iran, Georgia and the "Stans". He has lectured and led tours in several countries. Recently his travels have been concentrated on central Asia. Gavin and his family own Macplants, are supporters of The Caley and are well-known as exhibitors and stallholders at Scottish Horticultural shows. This year, Macplants exhibit at Gardening Scotland won a Premier Gold Medal. Gavin's talk will cover the cultivation of Meconopsis and the story of the gentians bred by his father Ian, an expert in the genus. 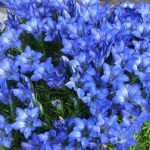 It was he who created Gentiana 'The Caley'. This is a joint meeting with the SES Plant Heritage Group. Caroline and husband Andrew run the Rossie Estate in Fife. She is a member of the Quaker Backhouse family who, over a period of 100 years, through three generations of Backhouses, created a National Collection of daffodils. The collection and cultivation had a huge impact on the growing and preservation of these important and rare species. It has commercial significance - Britain supplies 90% of the world's daffodil needs. THIS EVENT IS NOW FULLY BOOKED. PLEASE DO NOT ATTEND UNLESS YOU HAVE BOOKED A SLOT - WE DO NOT HAVE THE SPACE TO ACCOMMODATE MORE PEOPLE. THANK YOU. 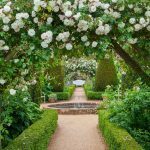 Get ready for another of our ever popular pruning workshops. The workshop will be held on The Caley Demonstration Allotment at the Bridgend Allotment site, Old Dalkeith Road, Edinburgh (not far from Cameron Toll). Emma is the Manager of IUCN UK Peatland Programme, based at the Scottish Wildlife Trust. She previously worked as a wetland ecologist, predominantly in Scotland, and has made a study of blanket bog habitats. The use of large quantities of peat in horticulture has long been a matter for controversy. Emma will provide up-to-date information on the subject. The Caley's Junior Spring Show will take place on 23rd and 24th March 2019 in the John Hope Gateway at the Royal Botanic Garden Edinburgh. 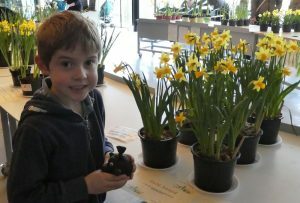 This year the bulb growing competition has been expanded to include junior groups such cubs, brownies and other groups as well as schools and nursery classes. For further information, contact Paula Collings at schoolspringshow@rchs.co.uk. The Caley's annual Spring Bulb Show will take place at Saughton Park, Edinburgh. This is an exciting time for The Caley as we move into our new permanent home at Saughton Park. Be part of the inaugural Spring Bulb Show in our new surroundings. 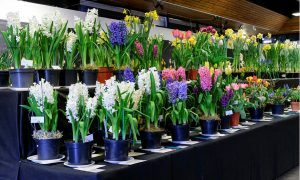 For further details about the show, visit our Spring Bulb Show page where you will find the show schedule and an entry form ready to download. Alternatively, you can email springshow@rchs.co.uk.